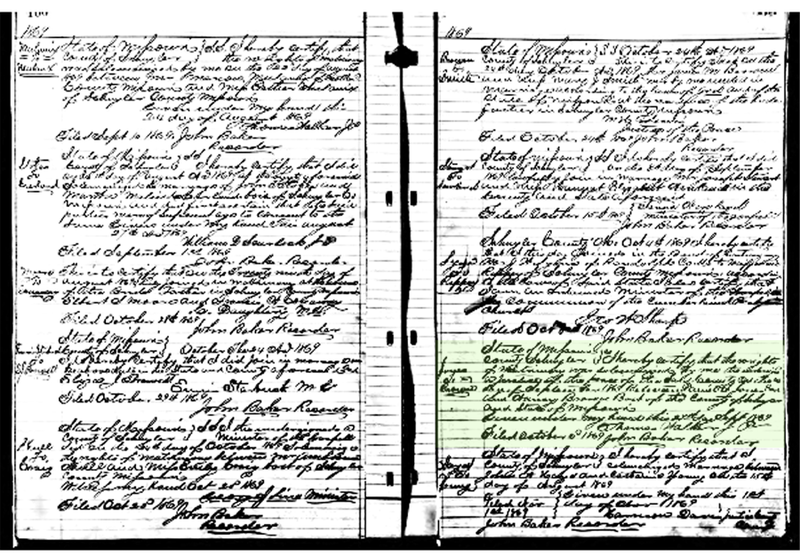 Daniel and Nancy (my great-great grandparents) were married in Schuyler County, Missouri on September 27, 1869. Strangely enough, the only two “brick walls” in my genealogy research come from one parent each of Daniel and Nancy. 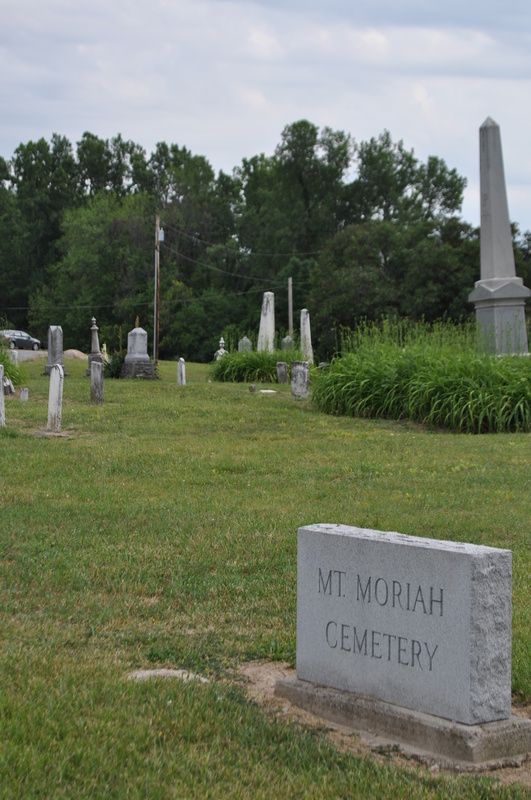 They spent the rest of their lives in Schuyler County and are buried there in Darby Cemetery. I found this image on ancestry.com. I have been to Schuyler county several times as we still have family there but those were my pre-genealogy days. I will have to make sure to stop by the courthouse the next time we are there and get a look at the original. 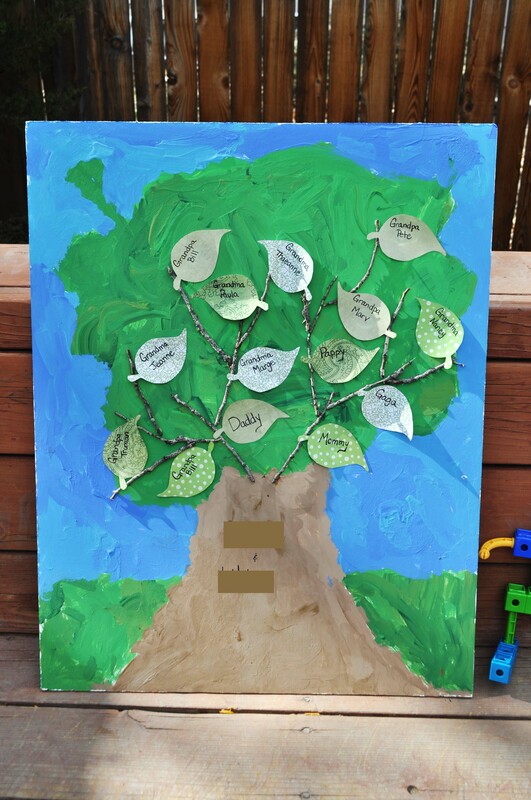 Friday’s Family History Craft: A Family Tree for the Kiddos! I have decided that Fridays are going to be dedicated to the more creative side of family history and genealogy. Sometimes I will go with a family recipe based on an ongoing prompt from Geneabloggers and sometimes, it will be a craft with a prompt of my own creation…Friday’s Family History Craft. Today, marks the first of these prompts and I hope that this post inspires you to get your little ones involved in family history early on. Oh and FYI if you think that this post looks familiar, you may have seen it over at my other blog Musings from Mommyland. 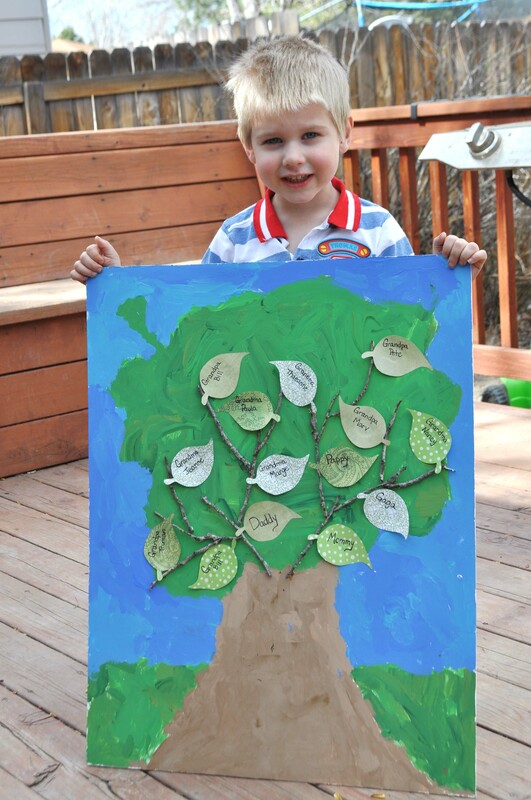 My 3-year-old son and I did this family tree craft a few months ago, but he still loves to go up to it and talk about all the leaves on his tree. The Boy Child and I had a great time putting this craft together. He has a blast painting and it was a really good chance to talk about our family too. And now that it is done, he loves to look at and point out which leaf is mommy or daddy or grandpa or grandma. My son’s name and my daughter’s name are written on the trunk though I photoshopped them out here. Posterboard or foamcore board…something on which to paint. I opted for a large piece of foamcore because I have found with little kids, bigger is usually better. 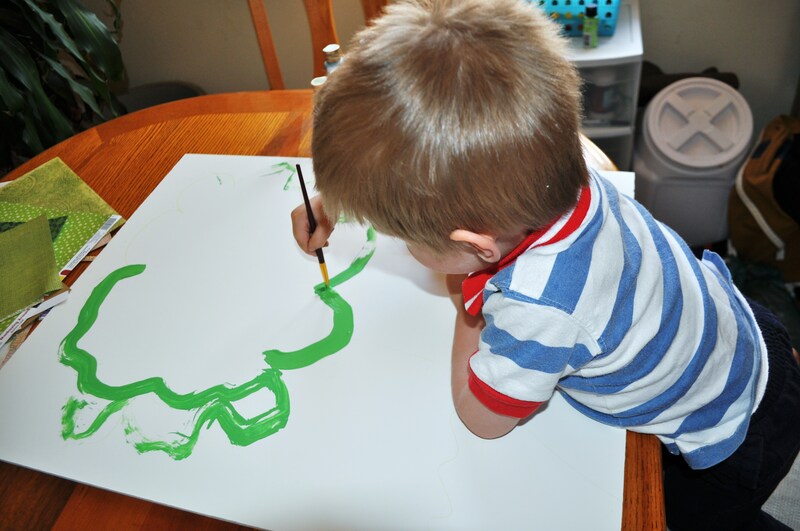 To start out, I drew a really loose outline of a tree and grass just to give him a place to start. Then I squirted some paint onto a tray and let him go to town. I did stick to one color at a time just to avoid a blobby brown mess. To give him a few more options, I put out a couple of shades of each color though. “Noodle” had a blast painting…yes it is a bit messy, but worth it. It was great watching him screw his face up in concentration. 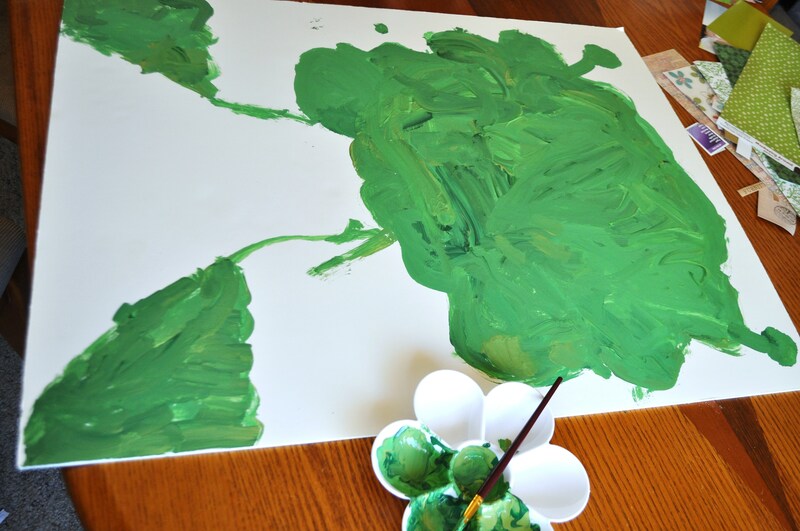 While the paint is drying, depending on the age of your child, either you or them can cut out the leaf shapes from the scrapbook paper. I just found a really simple leaf template online and used that to trace what I needed. One little hint…don’t get too dark of a shade or green or something too busy other wise it won’t be as easy to read the names. Once all the leaves were cut out, I let Connor pick out which one he wanted for each person. We used 14 leaves all together. I put his and Lily’s name on the trunk as a place to branch from. The next part is more for you to do. 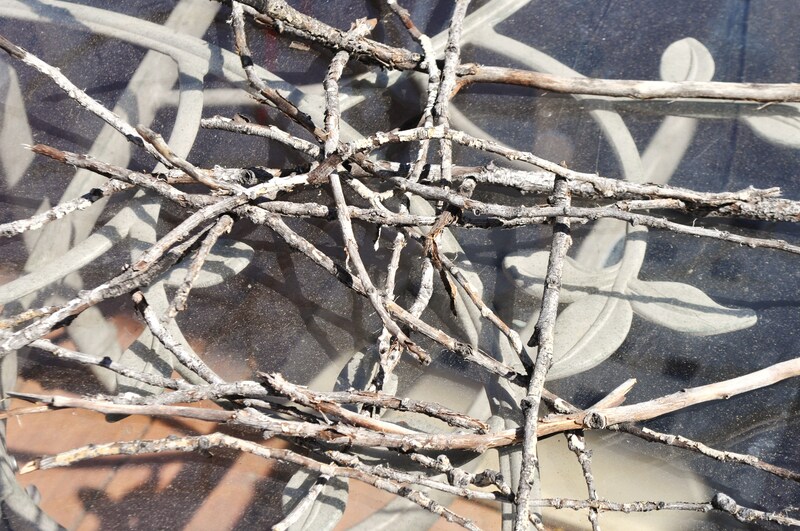 Take the twigs and arrange them on the board to make the branches of the family. Two for mommy and daddy and then two coming off each of those and then two more coming off of those. We went back to great-grandparents because Connor and Lily are lucky enough to still have 3 of their living. You can go as far back as you want. If you are going further back, I would say make the leaves smaller though. It gets crowded fast. 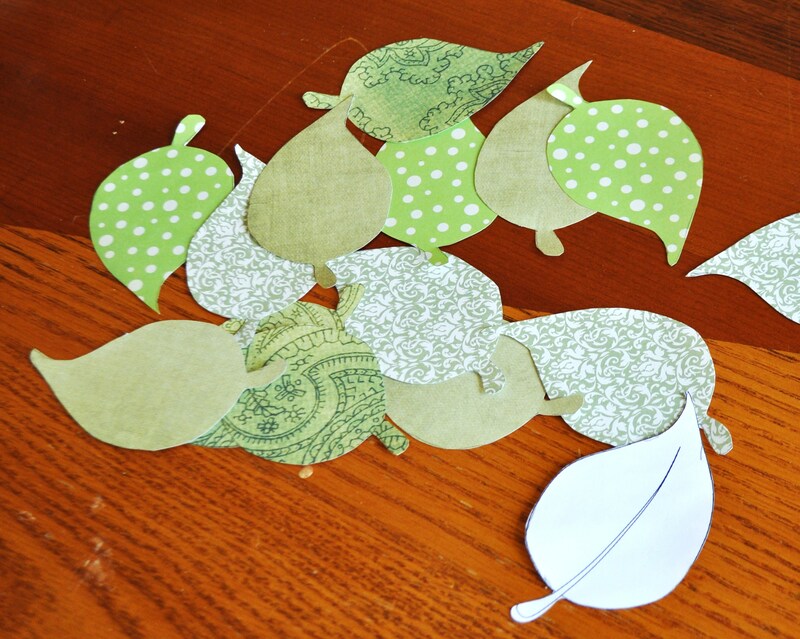 After the twigs are glued on, glue the leaves on and there is your family tree! So I use this photo as the cover photo for the blog and thought maybe I should tell you who it is. I love a good family photo and this one has always stood out for me. Probably because I am visually reminded that Daniel Jones (#2) is the only male of the family after the death of his father. L to R: Daniel Sydney Jones, (#2) Nancy (Brown) Jones, Annie (Jones) Jackson, Elizabeth Emily (Jones) Brook, Mary Frances (Jones) Shepard, Jane Myrtle (Jones) Gibson, Bertha (Jones) Pottorff, and Grace (Jones) Jefferies. This is the family of Daniel Sydney Jones (#1…According to my grandma, they were not Sr. and Jr. They just had the same name so I refer to them as #1 and #2) at his funeral in February of 1916 in Schyuler County, Missouri . This photo includes his wife and all of his living children. 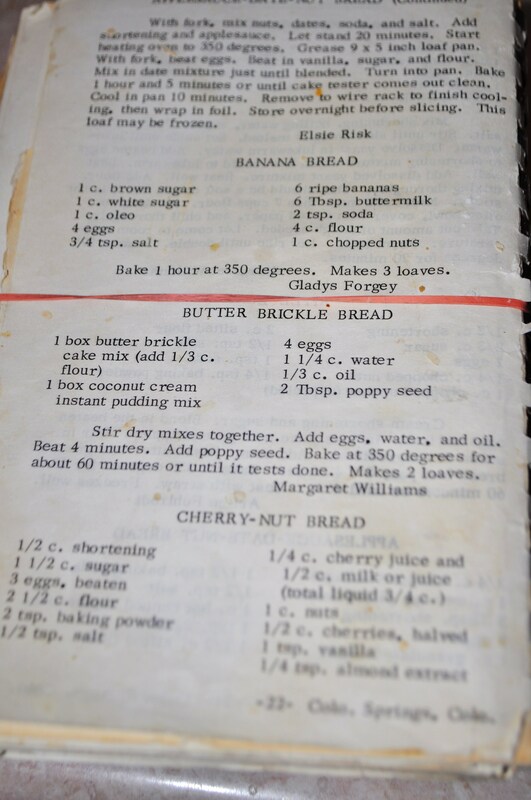 Ok, so this recipe didn’t come over to America tucked amid the precious possessions of my ancestors 300 years ago or anything like that, BUT… I definitely consider it a family recipe, because there is no food in the this whole world that takes me back to being a little kid sitting in my grandparents kitchen the way this banana bread does. Let me put it a geeky way…you know that love potion in the 5th Harry Potter book/movie that changes smells depending on the person, if I walked up to that potion, mine would smell like lilacs and banana bread. Anyways, I don’t know when my grandma started using this recipe, but from the looks of the cookbook she pulls out when she makes it, it has been awhile. I tried to find a date on the cookbook this morning, but between the ancient rubber band holding the place on the banana bread page and the fact that the cover was actually ripped off, I was unsuccessful. Luckily the when doesn’t really matter. 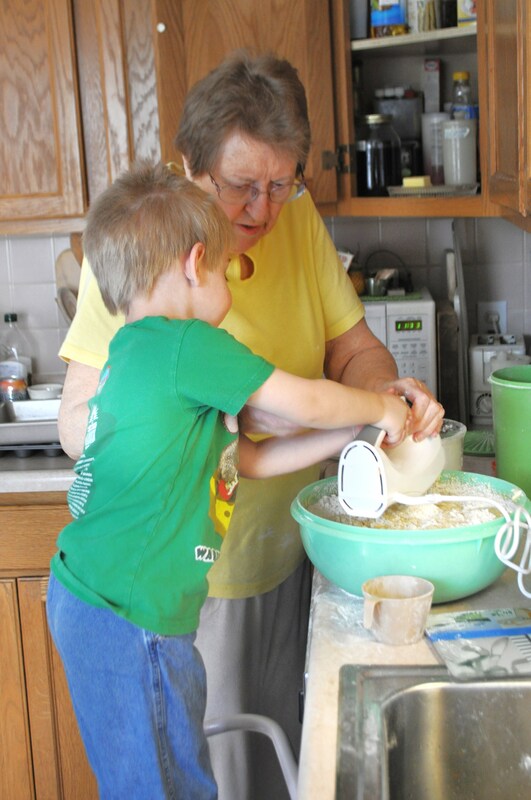 First, mix the flour and salt and baking soda in a separate bowl. 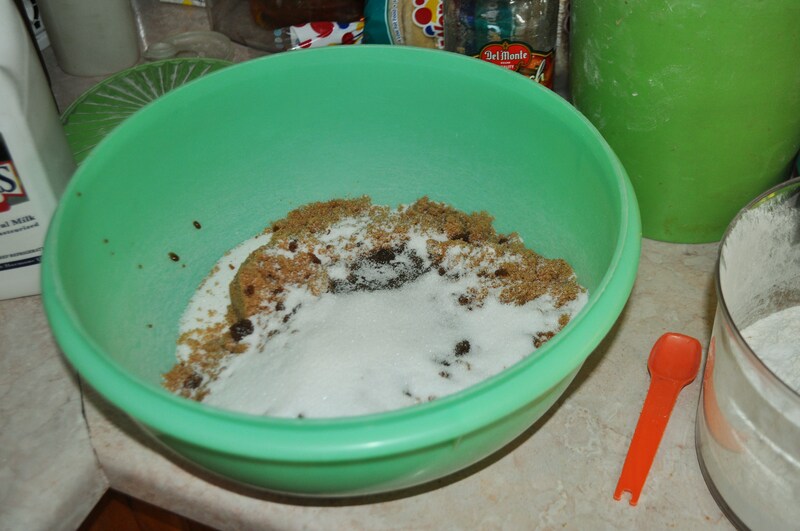 Then add the white sugar and brown sugar to a large mixing bowl. Now, add the butter and cream together. 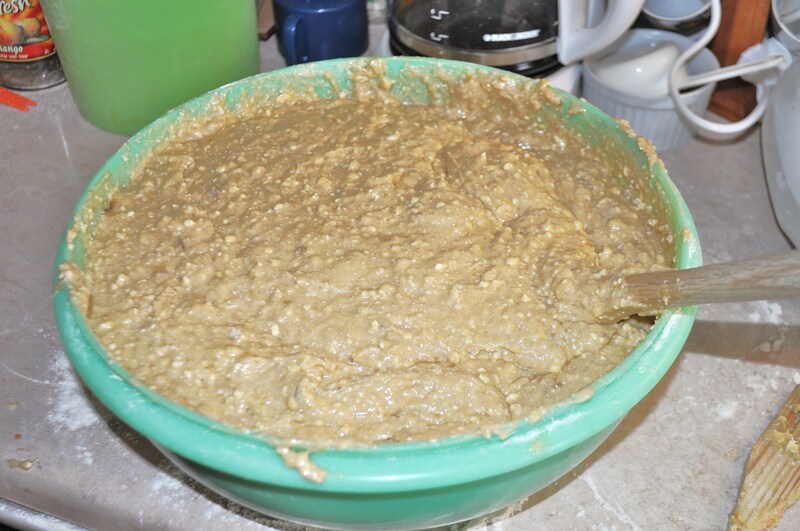 Next, add the eggs and buttermilk and mix well…but don’t overdo it or the bread will get rubbery. 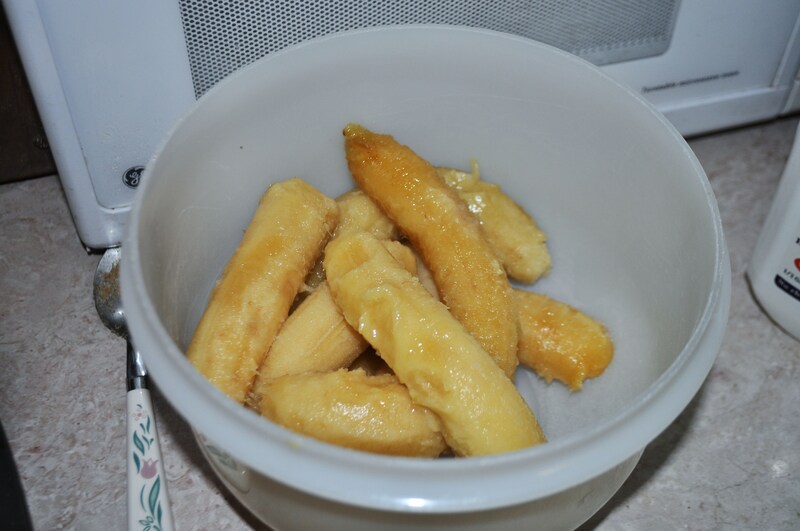 Now add your chunks of banana and mix until they are well broken up and distributed in your mixture. 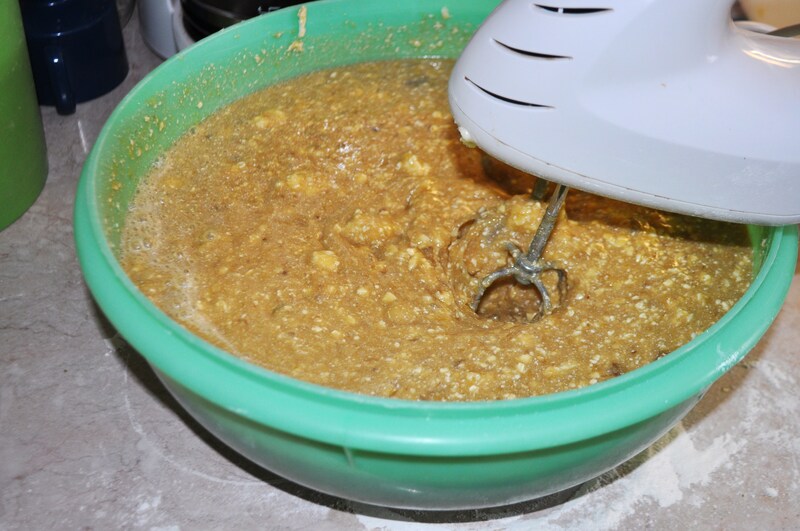 Next, add the flour mixture and combine everything well. Stir in the walnuts here if you want. 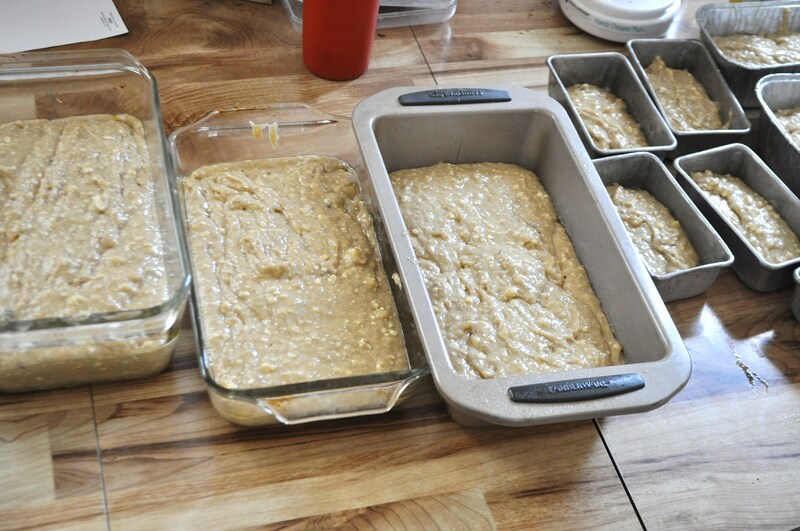 Put the mixture in greased loaf pans or muffin tins…fill about half way. The recipe makes about 3 loaves. Finally, put the pans in the oven and bake at 350 degrees for 45 minutes to an hour. 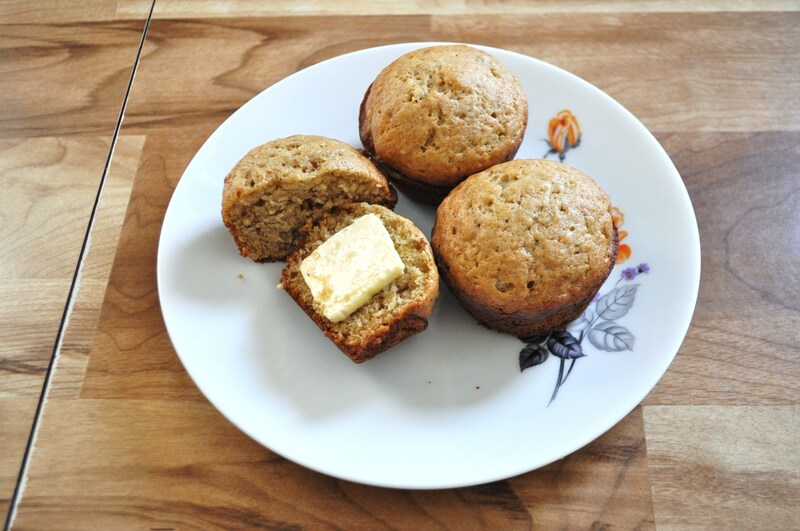 If you are doing muffins maybe even start checking a little earlier. 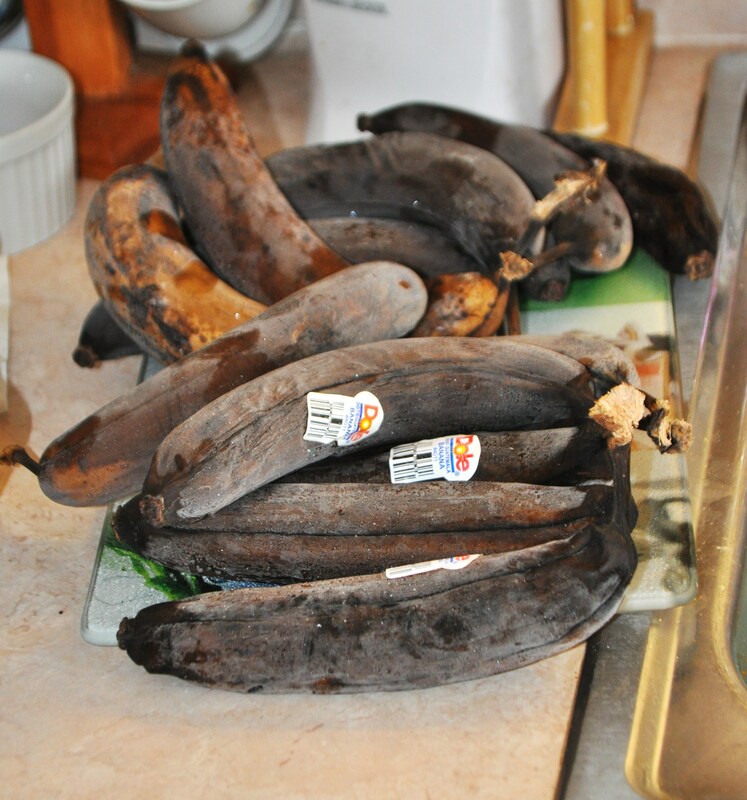 Checking more is better than burnt banana bread…trust me. From my family to yours. Enjoy! 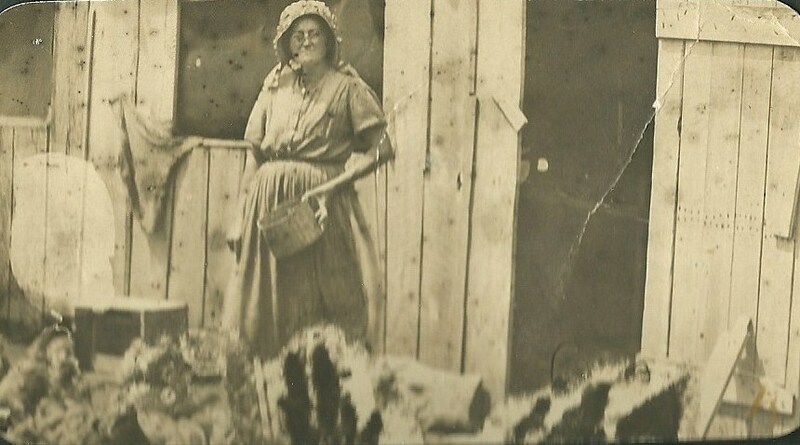 This is my Great-Great Grandmother Mary Elizabeth (Henderson) Tallman…not to be confused with her mother Mary Elizabeth (Atterberry) Henderson. From what I have gathered, Mary Elizabeth wasn’t always the most pleasant person to be around and I think I can see this from this picture. I still love it though. It seems like it is a rare occasion to come across a picture from this time period that isn’t super staged but is more natural. There is nothing quite like seeing your ancestor’s headstone in person. It is one thing to know where a grave is and another thing to actually see it in person. 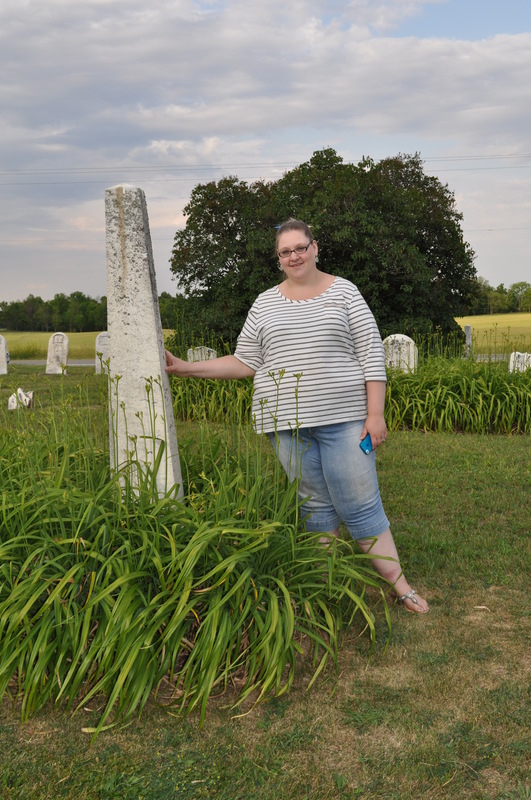 Standing next to the final resting place of your fifth great-grandparents can be quite awe-inspiring. 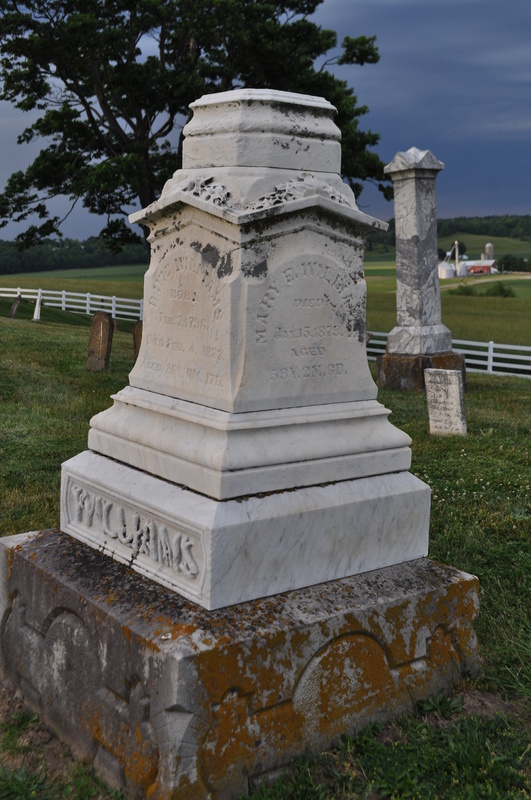 Last week, I shared some photos of David and Minerva Williams’ headstone and these photos of Benjamin and Ruth (Taylor) Tallman come from that same trip to Ohio. Benjamin Tallman married Ruth Taylor in Burlington County New Jersey on December 21, 1815. They lived there for a bit (it is where all of their children were born) before moving to Logan County, Ohio. 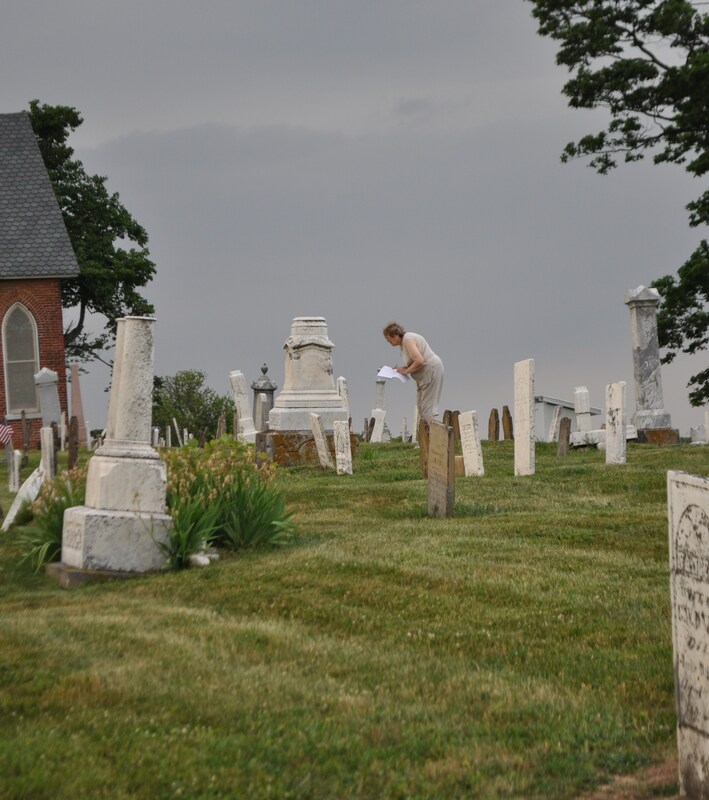 Benjamin and Ruth Tallman (along with several other Tallmans) are buried in Mount Moriah Cemetery. 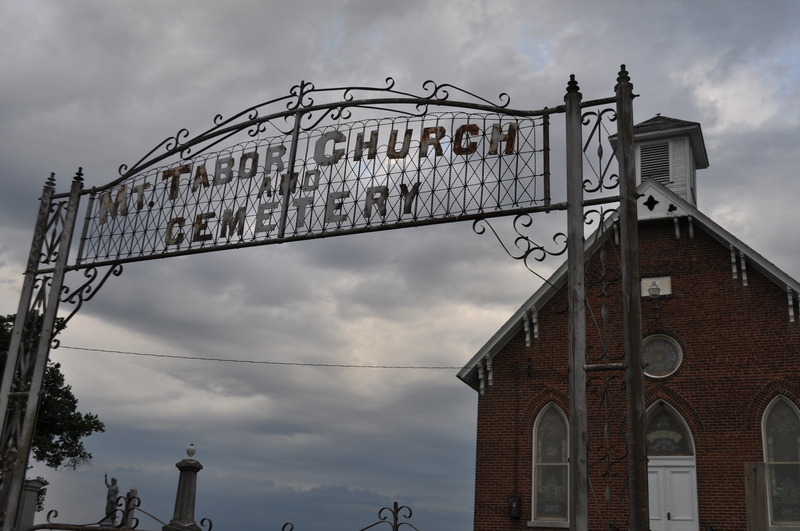 This cemetery is located at the northwest corner of State Route 559 and Township Road 177 in Zane Township, Logan County, Ohio. There apparently used to be a church to go along with this cemetery, though I am a bit sketchy on the details for this. It is one of the things I am working on. Luckily, the cemetery is on the smaller side so we didn’t spend hours searching for the right headstone. After finding a few wrong Tallmans, we finally found Benjamin and Ruth. The headstone stuck out quite tall (am I the only one who the appreciates the fact that the Tallmans have a tall headstone…lol) among a huge patch of some sort of lily. We actually walked past the stone a couple of times because the writing was so faded on Ruth’s side. Just goes to show that you should pay attention to all sides of a headstone. Benjamin’s name was on the opposite side of the stone and the writing was in slightly better condition. The dates were pretty much unreadable, though luckily we already knew them. 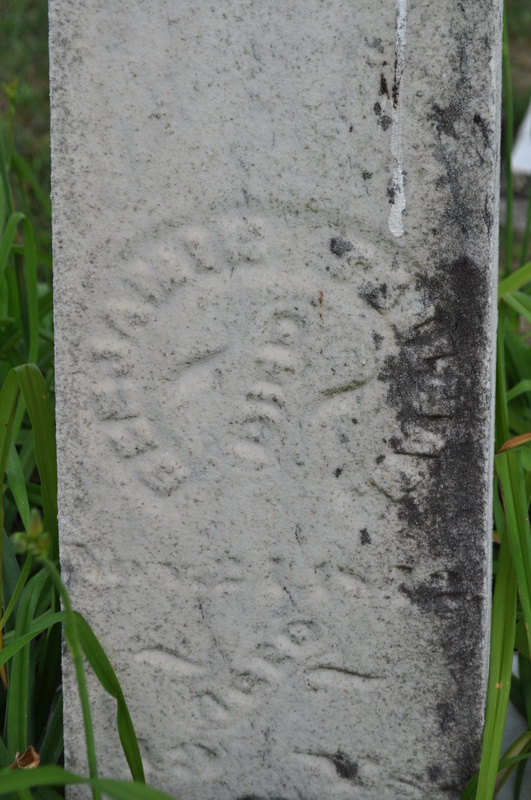 Benjamin died November 21, 1842 and Ruth passed away on February 22, 1861. The Tallman surname was not on Ruth’s side either, another reason we missed the stone the first time. I am so glad that we got to visit this cemetery. These headstones have been here for more than 150 years but, judging by the deterioration of the writing on these as well as the others nearby, I am not sure how much longer you will be able to make out the names. 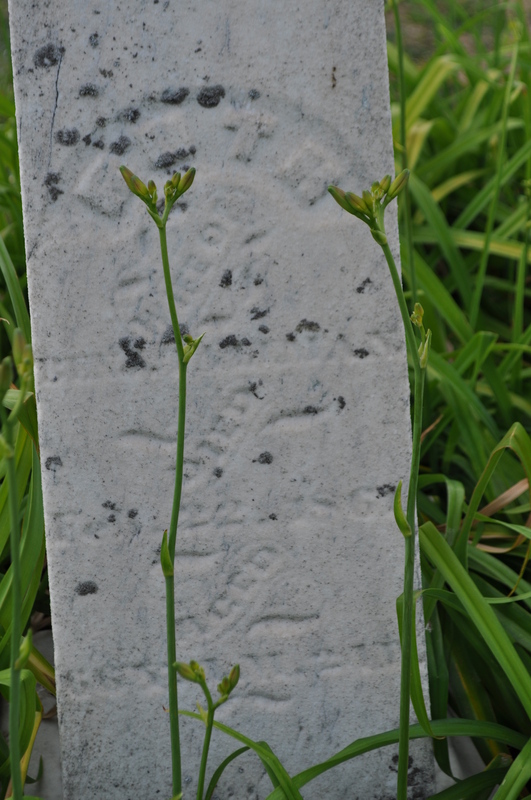 Several other relatives headstones were cracked and laying on the ground. It was sad to see, but I guess is part of life. As I said before, there is nothing quite like standing next to your ancestor’s grave. If you ever get the opportunity to visit the grave site of an ancestor, I highly recommend you take it. And if you are there, take a moment to enjoy the silence and give thanks to the people who made it possible for you to be. With my grandma’s recent health scare, the kids and I have been spending more time over at her house helping out and just hanging out. The other day, we were going through some of her albums when I realized that the one holding all of her obituaries, funeral cards, and headstone photos was a bit old. Okay, old, well that’s fine…EXCEPT, that the pages she was using were the kind that were self-stick — with the glue that is not so good for the longevity of documents. And this wasn’t the only one like this she had. Okay, well now we have a project for the next few weeks. My grandma has been the family historian for years — a lot of years actually. She is the one with all the photos and documents and newspaper clippings and well, actually everything. And she is quite well-organized in her own way. But, if her house caught fire tomorrow, all of that would be gone. There are no electronic backups safely tucked away with someone else and I don’t think that there is anyone in our family who could name the people in half of the pictures she has. So, today we went out and got what we needed to get her up to date. And, in addition to transferring all of the photos and clippings to a place where they will be safe for years to come, we are also taking this as an opportunity to scan and back up everything. We have flash drives and a tape recorder because I want to make sure that in 20…30…50…100 years, the future generations will know who is in the photographs and how exactly they are related to our family. So, as we get ready to take on this rather large project, I ask, are you up to date on your storage and organization? When doing genealogy research, the focus tends to be on the vital statistics of your ancestors. When they were born, where they lived, who and when they married, what their children’s names were, when they died, and where they are buried. These are the bread and butter of genealogy and I love these records because they give you dates and a timeline and geographical information. However, what they don’t give you, and what I find myself increasingly wishing for is a personal connection to your ancestor. For example, I have a Great-Great-Great- grandmother, Phebe (Avery) Jones, who through her lifetime, went from North Carolina to Indiana to Iowa to Missouri to Montana. This is the information I have gathered vital records and census data. What I don’t know is why. The most intriguing of my why questions is, why would a 60 something year old woman make the trek from Missouri to Montana in the 1870’s? What I wouldn’t give to find a diary or journal or letters from her. Ok, back on track now…we can’t go back in time and talk to our ancestors about the how’s and why’s of their lives. But, we can talk to the generations still here with us to make sure we find out everything they know as well as the opportunity to pass down a part of this knowledge to the future generations. Recently, I have been reminded that time is a fleeting thing and that you may not have as much as you think you do. My grandmother, the one I sometimes talk about on here, has had a bit of a health scare recently. She had to have an emergency surgery last week and now that terrible C-word has come into play. The doctor sounds quite optimistic and with some chemotherapy, it sounds like there is a very good chance that things should be just fine. Everything that has happened recently has made me realize two things. First, just how important my grandma is in my life and that I need to tell her this a lot. And second, that she isn’t going to be here forever. It is easy to put off doing something like an interview of a family member thinking that there is more time, but the fact is you never know just how much time there is so don’t put it off. I have heard stories from my grandma about her parents and siblings, but I have never really sat down with her with a recorder or video camera and had her tell me her story. This is the connection to the past future generations will be searching for. I think that I am lucky and still have time on my side, but you can be sure that I won’t be putting off this interview anymore. 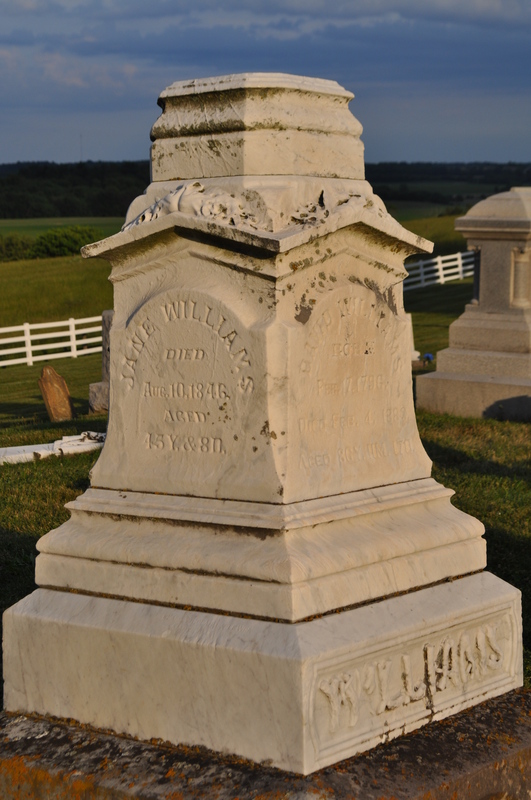 While on our recent trip to Logan County, Ohio, my mother, grandmother, and I did a little cemetery wandering and were very excited to come across the headstone of David and Minerva (Ocheltree) Williams. David and Minerva were the parents of Elinor Jane Williams who married Francis Austin Tallman. 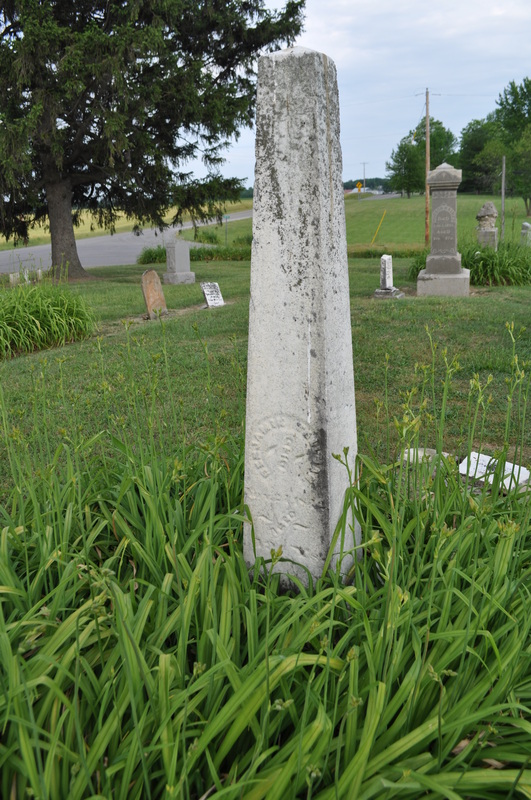 The headstone was actually in the neighboring Champaign County in the Mount Tabor Church Cemetery. This church is still standing, though from what I have gathered, it was given to the county and is not actively used anymore. I had come across the possibility that David and Minerva were buried in this cemetery and was so glad to be able to verify this. This headstone also provided us with some information. We never knew the death dates of David and Minerva and because of headstone we now do. We also found out that Minerva (Jane) died fairly young and that David remarried. This is a very large stone with David’s information on the front, Minerva J. and Mary E. each on a side, and a bible verse inscribed on the back. 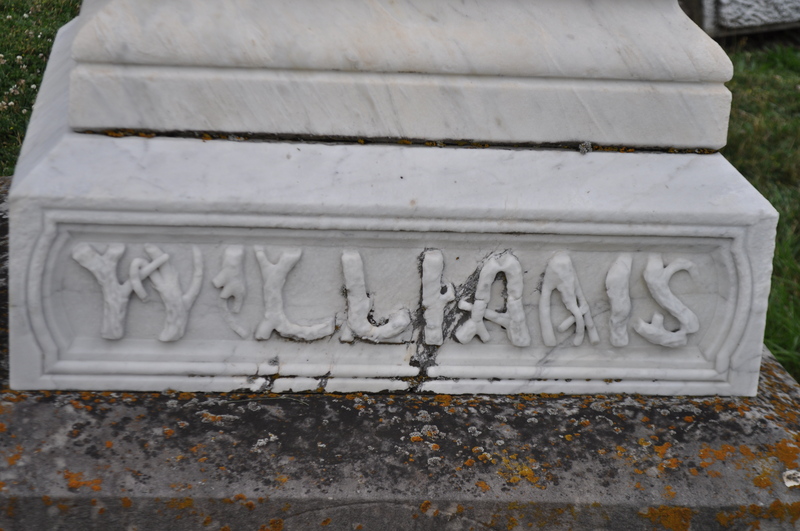 The Williams surname on the bottom was really cool looking and very intricate. I don’t know if David Williams was wealthy or owned a lot of land, but this headstone was large and impressive and seems to me like it would have been quite expensive. The Mount Tabor Cemetery was quite large so I am thankful for the rather large headstone. It made the search a little easier. Now, if only proving or disproving the theory that the land he owned in Ohio came from some Williams family member’s service during the Revolutionary War were as easy as finding his headstone. I have many more photos of this headstone and the cemetery so if you have come across this article and are also related to David and Minerva, please feel free to contact me for them.